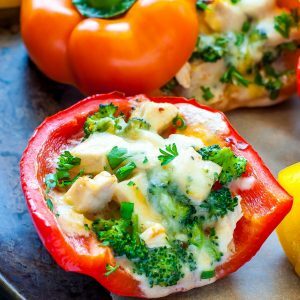 These Cheesy Chicken and Broccoli Stuffed Peppers are quick, easy, and totally tasty! Slice the tops off of each bell pepper [or leave on for a bit of foodie flair!] then cut them in half lengthwise. Remove the stem from your broccoli [set aside for later use] so you're left with 3 crowns of broccoli. Next fill a large bowl with ice and water and set aside. Bring a large pot, filled to about 3/4 with water, to boil and add your bell peppers. Blanch in boiling water for 3 min then immediately submerge into the ice bath to halt the cooking process and prevent soggy peppers. Remove from ice bath after they've cooled and pat dry. Set aside. You can absolutely steam your broccoli instead, but to save time and yield perfectly tender results, I blanched my broccoli immediately after the peppers were removed from the pot. Simply submerge broccoli into boiling water and blanch for about four minutes or until broccoli is bright green and perfectly tender. If you like yours a little softer, add an extra minute or two to the cook time. Strain broccoli, dip in the ice bath, pat with paper towels and set aside. Next grab a cutting board and chop your cooked chicken and broccoli into small chunks. In a large bowl, combine broccoli, chicken, freshly grated gouda or cheddar cheese, heavy cream, and spices. You can absolutely substitute melted cream cheese for the cream if you prefer, or skip it altogether for a lighter option. It's addition in the recipe is to channel the classic chicken and broccoli casserole and add creaminess to the chicken. Next microwave 1/2 a teaspoon of butter with one large minced clove of garlic and cook for 30 seconds to soften. Sautéing will also work! Add buttery garlic to the chicken mixture and mix well. Arrange peppers on a non-stick or parchment paper lined rimmed baking pan or dish. Stuff each with the cheesy broccoli mixture and top with a little extra cheese, to taste. Bake 350 center rack for 15-25 minutes, or until your ideal level of tenderness. Remove foil and broil on high for 1-2 minutes for golden bubbly cheese. Garnish with extra parsley and red pepper flakes as desired. Fresh green onion or chives also makes a yummy edible garnish. Have fun with it! Use leftover broccoli stems for THIS salad to prevent waste! You can also shred it into homemade broccoli slaw! YUM! *I baked several chicken breasts the night before to prep meals for the week, setting one aside for these yummy stuffed peppers. Feel free to follow suit or to cook yours up at the beginning of this recipe via your favorite method. Baking or Poaching is usually uber easy. Grilling works too!